Found 9 blog entries about Entertainment. Wednesday, March 4th, 2015 at 11:32pm. One of Chicago's most well known pieces of real estate, the Willis Tower, is on the market. It is supposedly up for $1,500,000,000. It was purchased from Sears in 2004 for $841,000,000 and was back on the market in 2011 but had no buyers. It is expected to sell for around one billion dollars in today's more robust commercial market and it won't be surprising if the buyer is not from the United States. Friday, December 7th, 2012 at 1:44am. We would like to extend this free pdf booklet of the Holiday Entertaining Guide that was provided for us by Homes.com. This is 100% free and does not requre your e-mail or anything and is safe to download. Please click on the link to download, not the picture. Feel free to share it with your friends and family. Wednesday, October 31st, 2012 at 1:53am. Halloween is my favorite holiday. I've always loved dressing up and I've even gone home and changed costumes and went out again (when I was about 12). I think I only did that once. Now I set time aside to accompany my son and my three grandchildren. My granddaughter and I drive to his house and we join the two grandsons and go trick or treating at the Homer Glen homes in my son's subdivision. It's a fun and friendly area where people are out with their costumed dogs and depending on the weather they might be sitting in their lawn chairs with a little something for the adults. It's chilly today so I'm not sure how many people will be sitting around. Friday, August 5th, 2011 at 5:09am. You might have seen The New Invaders at The Taste of Orland Park back in 2005, but the band is different today. Jay Goeppner is the new lead singer and there has been a recent addition of Rik Mallin on keyboards. Rik is singer Melody Mallin's Dad! Rik has been in different bands, the most recent was The Runaways. Jay Goeppner has brought new life to this 60's-early 70's rock band. Jay still performs with the Beatle Brothers and was with Instant Karma Band. He has played with many other bands, including back-up for Cheap Trick. Look for Jay's bio on The New Invaders website to see all of the famous people Jay has worked with. Wednesday, June 29th, 2011 at 11:13am. If you missed the 10th anniversary festival of Homer Glen's incorporation, you missed a great time! I went last Friday night to see my husband's band play, The New Invaders. I thought it was great that the village tried to get entertainment from the "locals." We live in Homer Glen (with an Orland Park address) and that is one reason The New Invaders were hired. The carnival was big, there was food, music and activities, making this Homer Glen's biggest festival to date. Our friend owns Chesdan's Restaurant and was one of the sponsors. Sunday, September 12th, 2010 at 8:37am. Tiger Woods was in the house! Today was the end of the BMW Championship at Cog Hill Golf Course in Lemont, IL 70 PGA Tour players, including Tiger Woods, attended for a $7 million purse. I could see the blimp floating above Cog Hill on my way home from a wedding downtown. Lemont residents were aware of the ensuing traffic and took other routes. My husband forgot about it and got stuck in some heavy traffic on Route 83 on his way back from one of his gigs (he plays in a band). Tiger tied for 15th place. The winner was 26 year old Dustin Johnson, who faced some bad golfing this summer, although he did win in Pebble Beach this past February. Tuesday, June 29th, 2010 at 2:54am. It was great timing to be able to attend this year's Homer Glen Parade and Festival since we'll be moving to our Homer Glen home soon. My husband's old band (he doesn't play with them much anymore as he is in a different band) played last year and this year. I missed last year's festival so was happy to be able to make it this year, although I didn't see the parade. I thought that attendance was light but my friend told me it was twice as many people as last year's event. It will hopefully grow larger year after year. Someone mentioned that there was a wolf on display so I went looking. Before finding the wolf I stopped by a petting area with some interesting looking alpacas (I thought they were llamas), goats and a pony. Thursday, October 4th, 2007 at 9:12am. 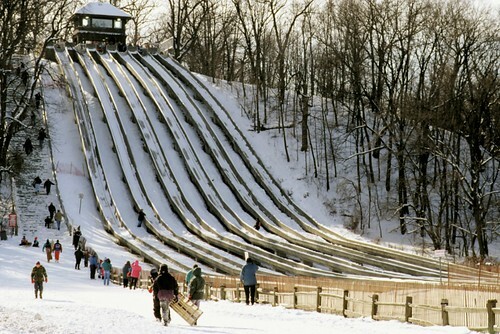 Let me first say that I have never had fun on the Swallow Cliff Toboggan Slides located in Palos Township. A friend of mine broke her back on them in the '60s and the truth is, I don't think I'd be interested even if that didn't happen. I'm afraid of heights and fast rides. But I've used that excuse about my friend ever since. My son Chad & I wound up at the Toboggan Slides walking a trail at Horseshoe Lake located in Palos Park over the summer this year. Because I've never been on the cliffs I couldn't remember exactly where they were located. Running into them during a trail walk was like finding an old treasure. Monday, November 21st, 2005 at 3:28am. We loved Judy. She was very patient with us trying to find the perfect place. Angel D.